Being a fragrance addict, I’m supposed to go around being drawn by smells and the fascination of following my nose to the next smell and just enjoying this fantastic olfactory world we live in. But sometimes I’m also bad and gravitate toward a fragrance because of its packaging. Thanks, L’Or de Torrente. In Bottle: Whoa, coffee! Well, this is coffee mixed with sweet lychee and a bit of tart currant but I’m surprised to find the note working so well with those other two elements. Applied: Sweetness up top with the lychee dominating the scene and dragging a tart blackcurrant note behind it. The lychee in fragrances never seem to completely go away to me until late into the mid-stage. and the lychee in this sticks around but isn’t obnoxious about it as L’Or de Torrente heads into this beautiful sweet amber and roses fragrance with a cup of coffee sitting nearby. The lychee takes its time to fade out during this stage for me and I’m happy for it as that rose, amber, coffee smell is awesome without any fruitiness necessary. The coffee note is dense and rich, and even though the notes look like they might clash, it actually words really well here and I’m particularly fond of the use of roses in this scent. The fragrance reminds me a bit of chocolate roses, a confection that doesn’t always land on my gourmand palette either, but always has this irresistible elegance to it. Now, this stuff is sweet but the rose and the amber help bring it away from gourmand and slot it more firmly in oriental. The final dry down is a vanillic amber scent with a fading coffee trail. I wouldn’t call this delicious, but it does smell fantastic! Extra: L’Or de Torrente was composed by Jean Jacques in 2001. Design: So this bottle is a bit flashier than I’d normally like but there’s something so appealing about its color and the leafy accents and the whole look of the thing. It’s organic in a way, mixed with metal and polished to luxury. I can’t quite describe why I find the bottle so awesome to look at it but there you have it. The packaging is certainly alluring to me. Notes: Mandarin orange, lychee, kiwi, black currant, magnolia, iris, cedar, coffee, rose, angelica, vanilla, white amber, precious wood. I can’t believe how well this fragrance works. There’s just enough mixing to make it all mesh together without clashing and the coffee, strangely enough, really holds up the roses and vice versa. I simply love this. 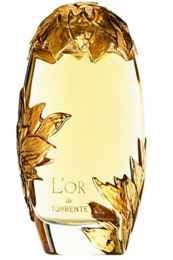 Reviewed in This Post: L’Or de Torrente, 2005, Eau de Parfum. This entry was posted in floral, oriental, Reviews By House, torrente and tagged angelica, black currant, cedar, coffee, iris, kiwi, lychee, magnolia, mandarin orange, precious wood, rose, vanilla, white amber. Bookmark the permalink. I was surprised at how hard it is to find this fragrance where I live too. Even online, it’s a bit uncommon.